Private equity funds are on a buying spree. Venture capitalists are raising billions for investments in startups. Angels are spreading their wings more often and readily. Add to this the Govt. of India’s startup initiative “Fund of Funds” with a corpus of Rs. 10,000 crores, and plans for allowing pension funds to invest in private equity and venture capital. It would be an understatement to say that the startup funding scene in India is on a hot streak. 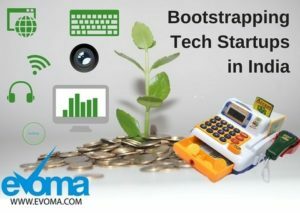 So as you think about joining the ranks of startup India, perhaps you’re wondering why bother with all these steps on bootstrapping a tech startup? Tech startup in Bangalore? Come to Evoma. 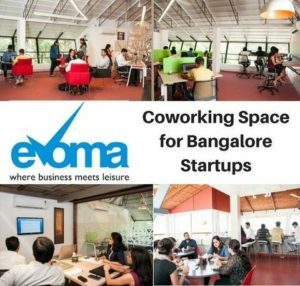 Get startup office space in one of the largest startup ecosystems in Bangalore. Why Bootstrap a Tech Startup? Reason #1 – BuzzSumo, Zerodha, Microsoft, Oracle, Coca-Cola. Do you know what all these companies have in common? They all started off as bootstrapped businesses. 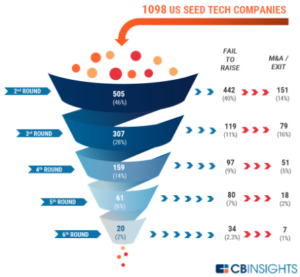 Reason #2 – A study from CB Insights shows that of 1,098 startups that received seed funding, only 46% managed to raise a second round, and only 0.91% went on to become unicorns (startups valued at over $1B). These are the odds that new entrepreneurs and startups seeking funds are up against. Unless you show some traction and generate significant revenue, finding investors ready to fund you is not so easy. So if you don’t want startup funding, or can’t get it, then bootstrapping is the way to go. As a bootstrap startup, you need to make alternate arrangements for one-time expenses to float your startup, and then the monthly recurring operational expenses. One word of advice here. Bootstrapping doesn’t mean you don’t spend any money. It just means that you don’t take business loans, and you don’t bring in investors. So, if you have some personal funds you can invest as seed funding, do it. Bootstrapping Solution: To succeed as a bootstrapped startup, you need to have a business model which generates sales and cash flow immediately. So you need a strong marketing plan and campaign that generates hype and leads before the official launch. It gives potential customers a chance to pay in advance for a pre-launch booking of your product or service. Bootstrapping Solution: You’re not borrowing or getting investors on board with crowdfunding. It’s a #growthhack – you’re simply booking a ton of advance sales, and you get enough sales revenue right away to build your startup infrastructure. If your business idea is not innovative or novel enough to attract crowdfunding, then meet the expenses out of your pocket and/or take in a co-founder who can share some of the burden. You may be sorely tempted to go the FFF route (Family, Friends and Fools), but bear in mind that bootstrapping means no debt or equity investors. You can bring in cofounders to share your burden, and if they happen to family, friends and fools, then so be it. Bootstrapping solution: Rent or lease capital equipment. Many manufacturers provide lease-purchase agreements under which you pay the lease until such time as your business growth and revenue permits you to purchase it outright. Bootstrapping solution: Work out of a coworking space – No deposit. No rent. No startup expenses. No maintenance. No bills. Excellent for startups with No money. Bootstrapping solution: As a bootstrapped startup, cash flow is your life-line. Focus only on core revenue generating activities, and eliminate or postpone everything else. It will slow down your growth a bit, but it also reduces burn rate and keeps the cash flow healthy. Think about it this way – A new rupee earned through more sales probably works out to less than 50 paise in net profit, after costs. But a rupee saved through reduced expenses is an entire rupee earned. Bootstrapping solutions: Payments to suppliers, along with the monthly employee wages you pay, form the lion’s share of your recurring expenses. It’s a big load off your chest if you have this under control. Trade credit – Suppliers typically extend 30 to 90 days credit to trustworthy repeat customers. It’s hard to get this credit when you’re an early stage tech startup with empty pockets, but you still need to try and negotiate extended credit deals from your suppliers. It may help if you approach suppliers through mentors and business leaders who are well known to all the suppliers. Want business support? Come to Evoma. Get a serviced office and meet hundreds of suppliers, vendors and established businesses in Bangalore. Factoring – If your business involves long receivables, you can resort to factoring. There are many reputed financing companies who do this for you. They buy your receivables at a discounted rate of between 2 to 15%. Once you sell your receivables, the risk and the task of collecting the receivables is not your headache. You can still end up with a net profit in these transactions if your pricing is able to absorb the high charges. Bootstrapping solution: Reduce your employee wages by making use of freelancers, consultants, and free interns on a project to project basis. If this doesn’t work, then take a training course yourself to learn the necessary skills. Another option is to launch the startup with two or more co-founders with different skill sets to complement your own skills. If all of you put together can handle all the work in-house, then you only need employees for growth, when you start seeing some traction and have enough sales revenue to hire people and pay their wages. In conclusion, I’d like to note that there are a lot of moving elements involved in a startup launch. So some of the tips above may not apply to your startup, and you may also have other challenges that require money. So don’t be bootstrapping because you want to, even if it’s not the right fit for you. Sure, it’s better to be a successful bootstrapped startup than a successful VC-funded one, but the keyword here is successful startup. If you’re not successful, no one cares if you were bootstrapped or funded – apart from the investor who believed in you. Startup looking for investors to believe in you? Come to Evoma. Get a serviced office and network daily with investors, mentors and business leaders.